On Sunday July 22,2018 Life was expelled, without warning or discussion, from the Lambeth Country Show. This letter seeks official clarification from you as leader of Lambeth Council about the actions of the council on that day. We applied to have a stall at the exhibition on 26 January 2018. We provided the show organisers with information about the stall and pictures of similar exhibits, including pictures of foetal models. We also provided a link to our charity website. In our application we clearly stated, “Life charity is a pro-life charity…”. On 4 April 2018, our application was approved stating that we had been “selected to exhibit”, clearly denoting a process of review and due diligence had been undertaken by you. We paid a fee and were placed on the registered list of exhibitors. After providing all requested information, we set up our stall on Friday 20 July and had a successful day with many positive responses on Saturday. However, on arrival Sunday morning, a Life volunteer found our marquee taken down and all our possessions completely removed from Life’s pitch. A member of the event staff said we had to leave the site as soon as possible. Despite having our contact details and a nominated contact person, we were not consulted prior to the organisers taking this action. Our young volunteers were then placed in a very stressful position when they arrived. The organisers distanced themselves from the decision making it clear that the decision had been taken by Lambeth Council. They informed us that Life was against the values of Lambeth Council and was not in line with the causes the council has been funding and supporting. However they were then unable to tell us what those values were. Lambeth Councillor, Ed Davie posted on Twitter on July 22 at 1.44am, that Life “wasn’t officially allowed. They were not on the approved list of exhibitors, we tried to get them removed and will make sure not there today.” This is a complete fabrication, as you are aware. Mr Davie’s inaccurate tweet was widely reported in the national press. At 1.44pm on the same day Mr Davie followed his earlier tweet with another accusation suggesting that Life had misled the council in its application. He tweeted “I’ve checked and stall in question was booked using inaccurate information. After the nature of the booking was revealed, and following complaints, the stall was prevented from opening on the second day of the show…”. Mr Davie’s tweet was repeated verbatim from the Lambeth Council Twitter account at 6.23PM on July 22, thereby wilfully perpetuating the distribution of misinformation about our charity that we lied and were disingenuous in our application. The reason(s) why Life was removed from the show by Lambeth Council. An explanation as to why concerns about Life by the council, were not raised with our charity in advance of the abrupt removal of our stand. 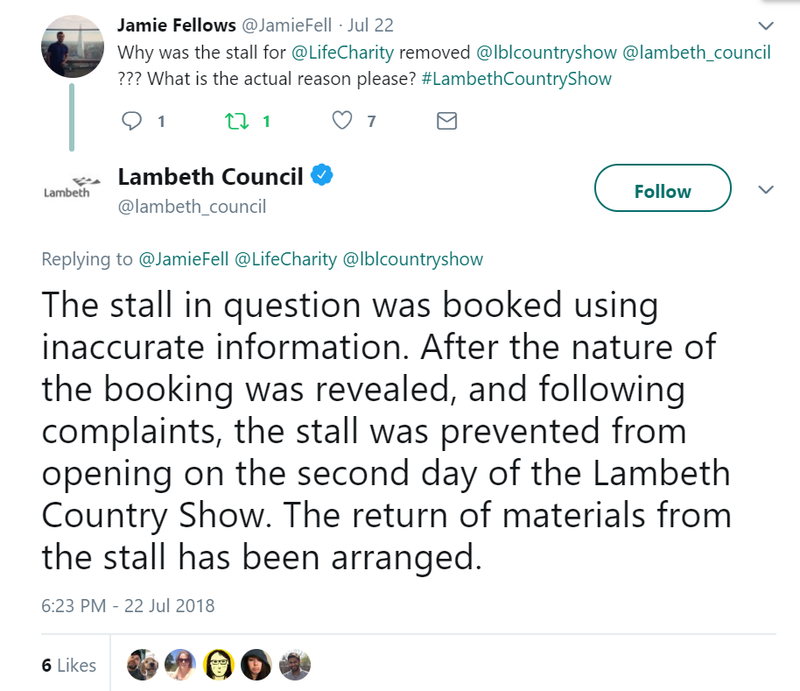 An explanation of what constituted the “inaccurate information” Lambeth Council has alleged on Twitter that we provided. In addition we request that Lambeth Council apologise to this charity for the shabby and callous way it has treated Life and its staff and volunteers in its haste to remove us from the fair. Our staff and volunteers were deeply distressed by the actions of Lambeth Council and we believe the least the council should do is offer an unreserved apology. This action by Lambeth Council is absolutely appalling. It even sounds like a criminal offence and must be opposed with all legal means. It also needs to be put into the public domain so that the Truth is established and that people can continue to trust LIFE. Sounds to me that Lambeth Council should receive a Criminal Prosecution.